Brian Schilling has a vision. 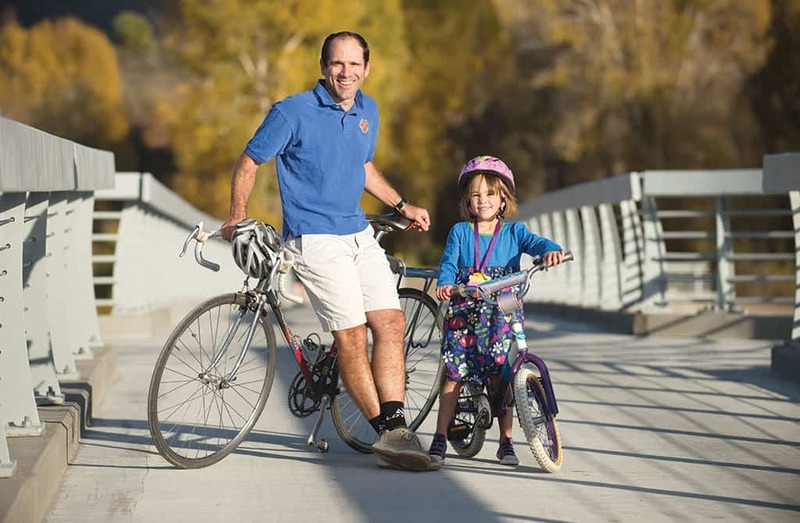 The almost-film school student, former biotech researcher, and current Jackson Hole Community Pathways coordinator imagines a day when people can pedal, walk, run, and toddle throughout the county without having to share the road with trucks and cars. Since assuming the helm at Pathways in 2006, his dream has progressed: Jackson Hole now has nearly sixty miles of paths for nonmotorized travel, including what might be the country’s most beautiful pathway, linking downtown Jackson to Grand Teton National Park. But there’s still plenty to do, such as connecting Jackson to the West Bank and Teton Pass, and working with GTNP on alternative transportation modes for the Moose-Wilson Road. Q: How’d you get from biotech to biking? A: Cycling had long been a passion of mine, and I’d been involved in Pathways as an advocate and as a member of the volunteer advisory board for the county when the previous coordinator left. I was ready for a professional change. Pathways were something I was passionate about. Q: What are the challenges of working with pathways? A: They’re not financial—if you have a good project and plan, you can get funding. They’re not technical, because building these isn’t rocket science. The main hurdles are political: working within the process of the county and town government, and making sure I’m not too far ahead of where the county and commissioners want to be and not too far behind what the community wants. A: All ages. Not everyone is an athletic thirty-year-old; we have to create an environment where it’s safe for a kid to ride to school and for a family to walk to the grocery store. Some people don’t understand why we would spend any money for people walking or biking, and that comes from a perception that pathways are built for the use of Lycra-clad bike racers. But those folks are out there regardless of whether or not there’s a pathway. Pathways are a way to get everyone else out—the people who don’t want to ride on the shoulder of a major highway with cars going seventy miles per hour. Q: You’re one of those Lycra-clad racers, aren’t you? A: I used to be. I started racing bikes my senior year of high school, ran and raced bikes through college, and raced road bikes the first few years I moved here. Today I mountain bike, and I ride my bike to work almost year-round. A: Yes. When it’s just me I have to worry about, I actually have no excuse other than my own mental limits or motivation—I’ll admit that when it’s 10 below it can be hard to convince yourself to get on your bike. But with the right gear it is actually pretty easy to protect yourself from the cold. Q: So if it’s not weather that stops you, what does? A: When I have to shuttle a kid or pick someone up at the airport or carry something too big for the bike. The kid excuse is winter-only, though—they’re back on the bike when the roads are clear. My reluctance to ride with them isn’t weather-related, it’s a safety concern. I just haven’t quite convinced myself or my wife that it’s a good idea to tow kids when there’s ice on the roads. If I could ride a separated pathway the entire way, then it wouldn’t be an issue, and the kids would have to endure their dad’s goofiness about riding bikes even during the winter.